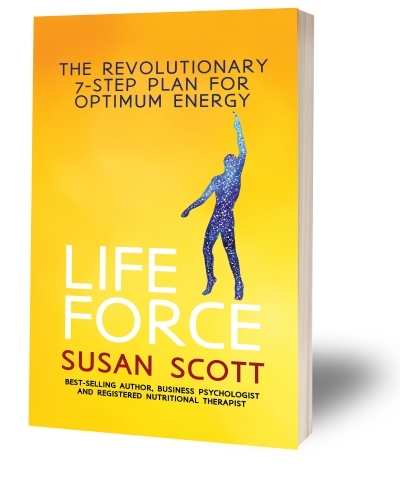 Susan Scott’s previous books are about keeping mentally and physically strong; what we refer to as resilience – the capacity to cope with everyday challenges and remain well. There is one missing ingredient though if you want to ensure true performance and success and that’s energy. As we hear more and more, ‘you can’t pour from an empty glass’. Energy is what helps us get more done, more easily and to a better standard. It is our oomph and joie de vivre. Our motivation and creativity. It is the very fuel in our tank and without it we’re not going anywhere. Stress, anxiety, money worries, managing excessive demands, overwork, relationship issues, working long hours, job insecurity…. goodness, life – all take their toll on our energy levels. ‘I wish I had more energy’ is frequently heard. ‘Why am I so tired and exhausted all the time?’ is a classic question. There is a trend in the workplace to do more with less ‘energy’ – as a lack of energy has the potential to be catastrophic. To summarise. Energy is the foundation of resilience and performance, without it all the skills, knowledge and experience in the world count for nothing. It has the power to take an ordinary person to extraordinary. It has a positive impact on the behaviour and performance in the workplace, on the bottom-line for the organisation but most of all, on the health and wellbeing of individuals. IT is an imperative. It will show you how to have the capacity to live life to the full mentally and physically – a mind and body approach. It is a one stop shop that does everything it says on the tin. It will leave nothing to the imagination as all the experience and knowledge built up over the author’s career will be succinctly and practically reproduced in this book. Using theory, activities, questionnaires and case studies, each section will be explained in a way that guides the reader to make the changes necessary to recharge their batteries and keep them topped up going forward. Susan Scott lives in Surrey and travels the world on business. She is a business psychologist, nutritional therapist, trainer, consultant and coach, as well as a public speaker and a best selling author. Susan believes that everyone – Young Professionals in particular – deserve to work in ways that foster their resilience, performance and careers. She is a Fellow and Member of many professional organisations, runs two successful companies and has years of experience developing and running consulting and training programmes for private and public sector companies in the UK, across Europe, in the USA and Australasia on change, leadership and wellbeing as well as providing personal coaching support for individuals. Susan is also privileged to have been Chair of the International Stress Management Association. However, what seems like an accomplished career has had more than its fair share of blips along the way, including a complete derailment only five years in. Despite these blips, Susan has managed to accomplish a lot because behind everything she does, Susan is brimming over with a passion to constantly learn with a strong desire to create work places that allow people to thrive and succeed – she believes everyone in the workplace should be allowed that opportunity. Inside every one of us is potential but this crazy, highly pressured world can often make it hard to achieve success – Susan’s role is to inspire and energise people to do just that. Susan brings a highly energised, knowledgeable and blended mind-body approach to her work. She’s practical and realistic but also, and very importantly, business focused. Susan has an MSc in Organisational Behaviour from the University of London, a Diploma in Nutritional Therapy (Distinction) from the Institute for Optimum Nutrition and is registered with The Nutritional Therapy Council. She is a Fellow of the Chartered Institute of Personnel and Development and a Fellow of the International Stress Management Association. She is also a Principal Member of the Association for Business Psychology and a Member of the British Association of Applied Nutrition and Nutritional Therapy.